If you are using an electronic scale then progressively add the dry ingredients (flour etc), zeroing the scale after adding each ingredient. Alternatively, you can use the cumulative weights of ingredients given in the recipe to continuously add to the mix. For balance type scales it is definitely easier to use the cumulative weights. Note: If your recipe requires Diastatic Malt then don’t add this to the dry mix, it will be added later. Put the weighed ingredients into a mixing bowl large enough to hold the whole recipe’s ingredients (stainless steel bowls are preferable). Weigh out the required water ingredient (preferably filtered water). Leave this on the scale and then add the diastatic malt (if the recipe requires it). Gently stir the malt into the water using a tablespoon, ensuring it is evenly dissipated, avoiding lumps. This will ensure that this useful enzyme source is evenly distributed throughout the mix. Diastatic malt catalyses the breakdown of starch in dough to yield sugars on which the micro-flora (bacteria and yeast) can feed. Make a crater in your flour mix inside the bowl. Using the wet tablespoon from above, scoop out the starter from its container and add it to the flour crater. You may need to dip the spoon more than once as this prevents the starter sticking to the spoon and simplifies the process. Ensure you get as much as possible of the starter – using a scraper to extract the starter can be more effective, but it depends on the shape and size of your starter’s storage container – or as I like to call it: it’s home. 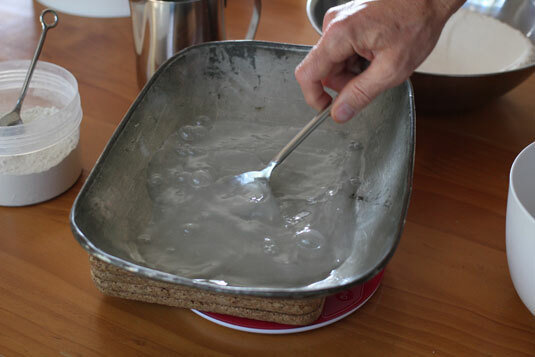 You can also dip the spoon into the flour and rub it and your fingers clean, ensuring the entire starter is used. Pour the previously weighed water into the crater with the starter. Make sure that you stir up the diastatic malt just before you pour the water in as it will tend to settle on the bottom. 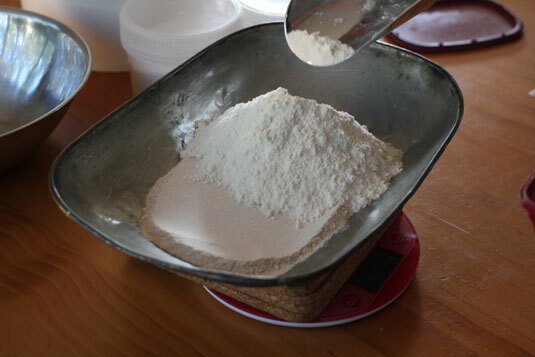 Using a scraper or your hand, gently blend in the flour and water towards the center, hydrating the flour. Once the water has been absorbed into the flour use your hands to squeeze the ingredients together. 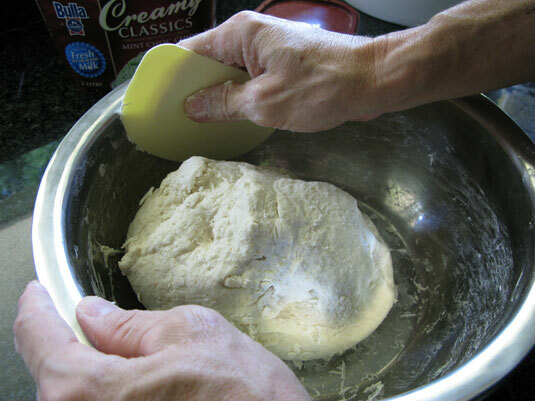 You are not trying to knead the dough, just blending the ingredients together evenly. It may seem that there is not enough water – but don’t panic, this is normal. You don’t want the sourdough too wet (unless a specific recipe requires it). Use the spoon to scrape off the mix from your hands and then fold the dough inwards and push the center with the heel of your hand (for large dough’s) or your fingers for smaller ones. Every now and then turn over the ball of dough and repeat the folding. This will eventually bring in all the dry ingredients into a nice sticky ball. 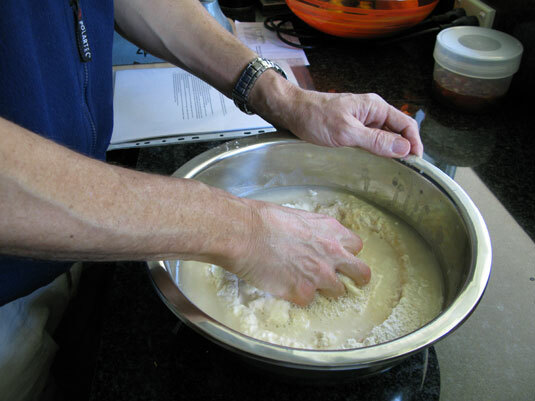 Use both hands to rub all the dough off your mixing hand – the dough likes to stick to itself more than to your hand, hence you’ll get lots of little dough balls and rolls forming and falling into the bowl, this is good. 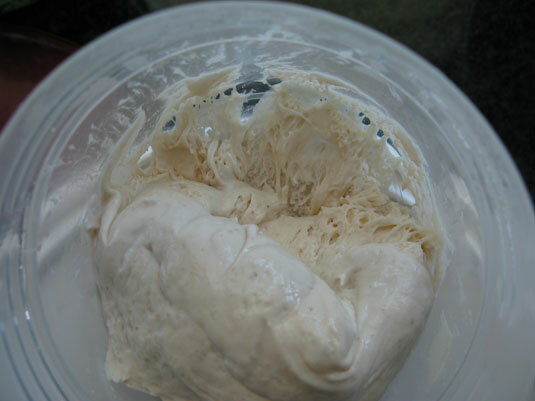 Finally, when all the dough is nicely balled up, place it into a container to ferment (you’ll know if you’ve done a good job of mixing when the bowl and your hands are almost clean; if not don’t worry, with practice you’ll get the hang of it). You can use the same mixing bowl if it is larger enough to contain the mature sourdough, otherwise a larger container will be required. Ensure that the container is covered – not air tight (you’ll get condensation and a surface sludge), and not completely open (the surface will dry forming a skin), cling wrap will be fine. Leave the sourdough in a location in your house that has a constant temperature away from draughts – preferably 20°C (68°F). 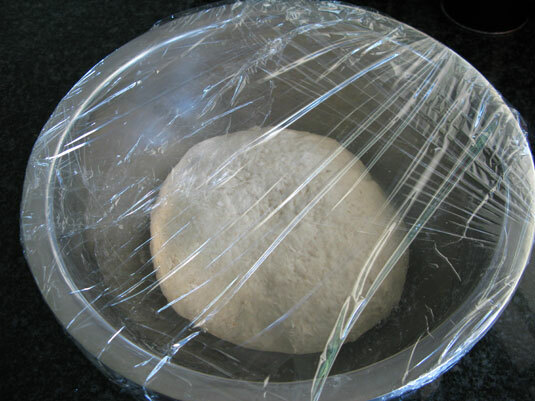 Leave the sourdough to ferment for the number of hours dictated by the fermentation time in the recipe.